I've had quite a few inquiries asking if I will repeat the project for 2009. Unfortunately...no. This was quite an undertaking and I don't think I'm ready to turn around and get started right away on another yearlong marathon. :) The goals I set for 2009 are more personal, some fitness and athletic goals I want to see fulfilled before my 50th birthday in 2010. I'll post about that in another month or so. I owe you all one more picture which I hope to post soon. A photo of all the boxes on their way out at the post office! And then I hope we will have a photo or something to post from the orphanage when the packages arrive. 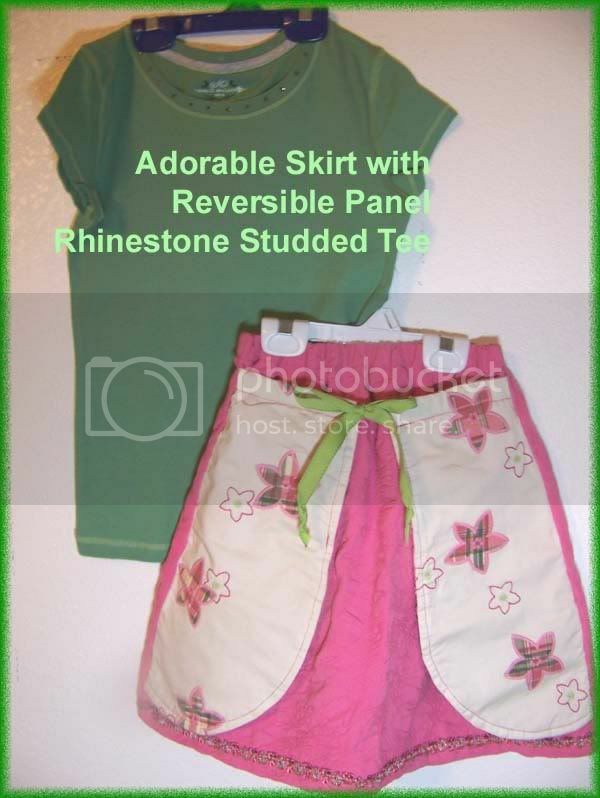 Last, But Not Least...Sharon's Skirts! 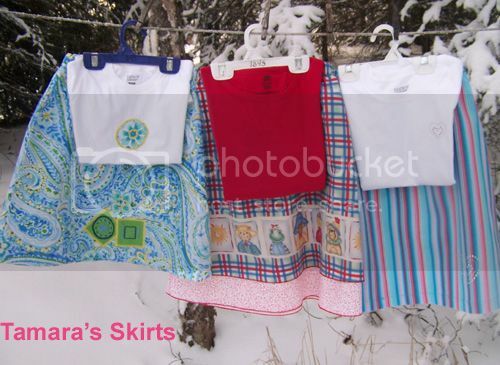 Sharon of Sharon Sews sent in these six delightful skirt sets. Each was beautifully packaged with satin ribbons and handmade tags. 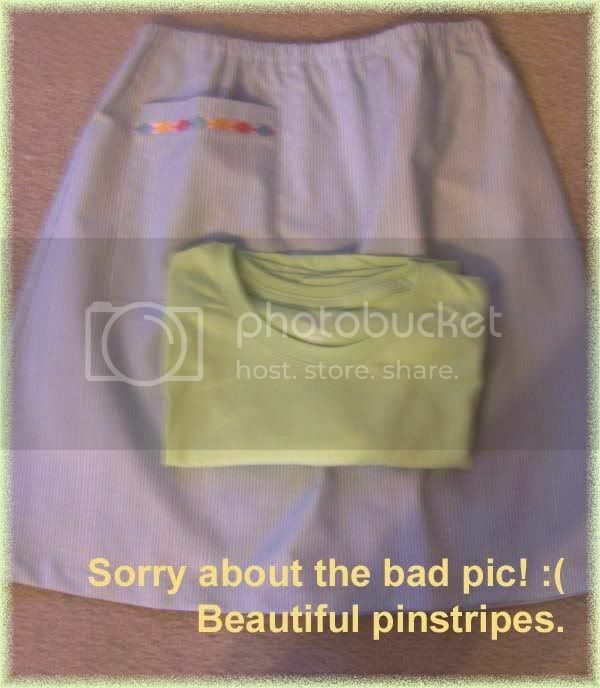 I wish the photos were better. It's still bitter cold here at 10 degrees below zero. I'm stuck with indoor photograpy which, as you can see, is not my strong suit. 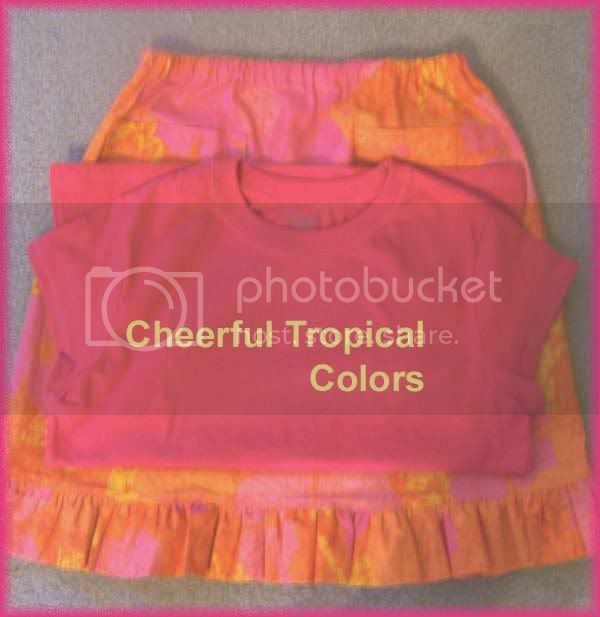 These skirts are even more adorable than the photos depict. 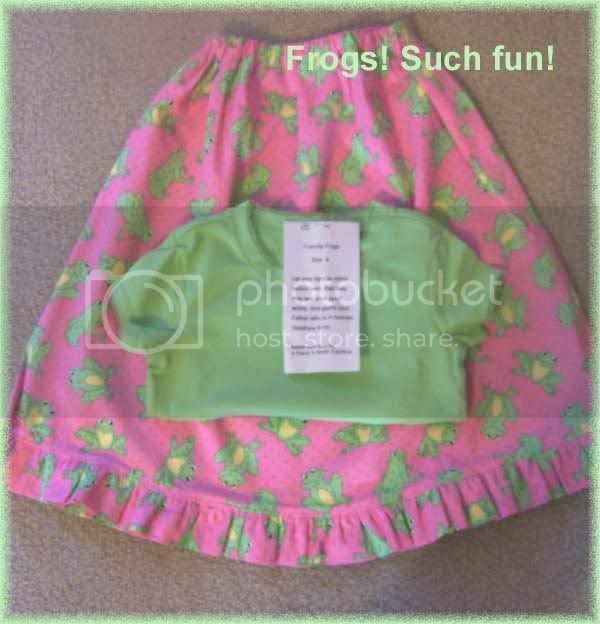 Stop in over at Sharon's blog and give her kudos for her generous gift. 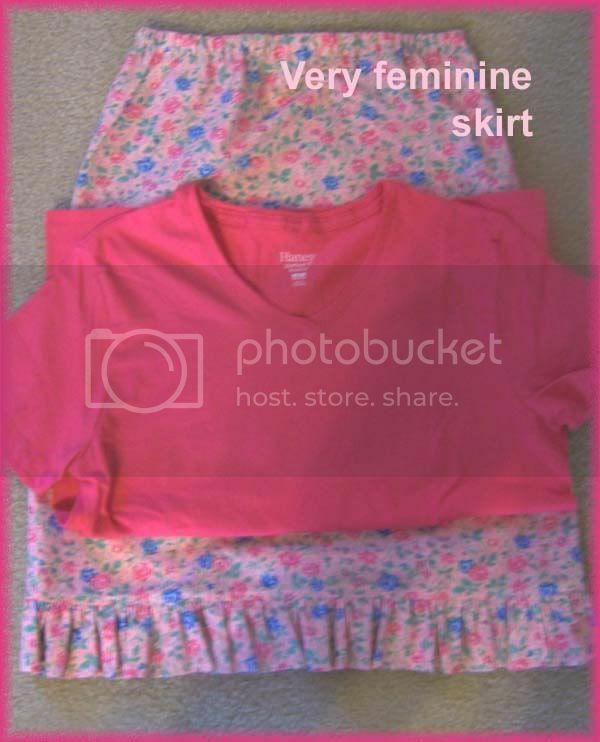 With this batch, we are DONE with our Hundred Skirt Project. I have to buy a few tees more and then add those to the box. Then it's simply a matter of addressing and taking it away to the post office. 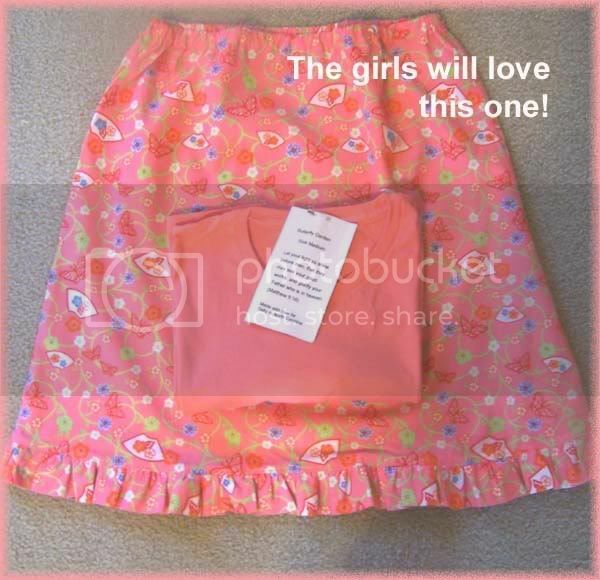 I will share pics of all the skirts in mass and the box once I get the last few things ready to go! 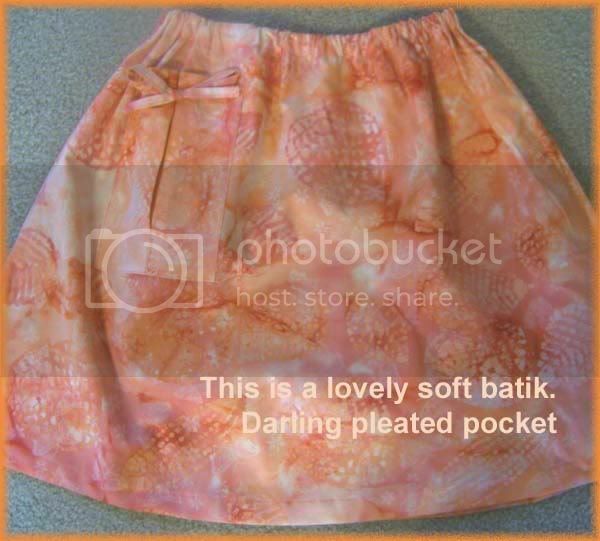 Scads of Beautiful, Fun Skirts! We are almost there, ladies! A ton more skirts came in this last week so pull up a chair and get comfortable. 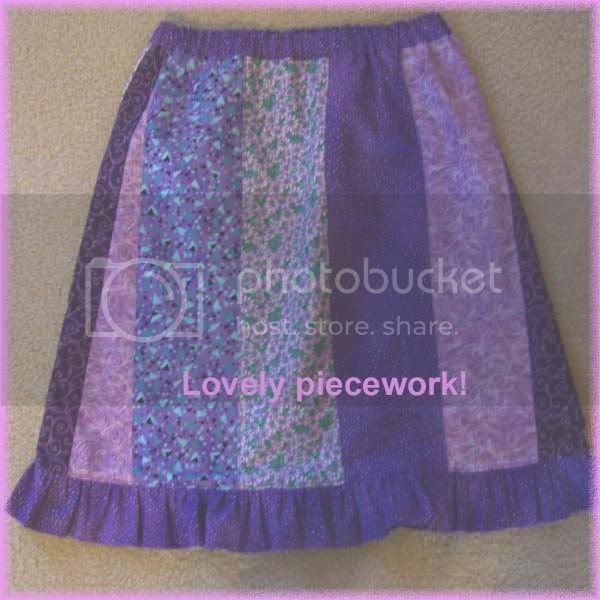 I received word of two more skirts on their way and I'm finishing up about 6 more here. I think that will put us at goal. I'm hoping to get these mailed to Guatemala by the end of this week. 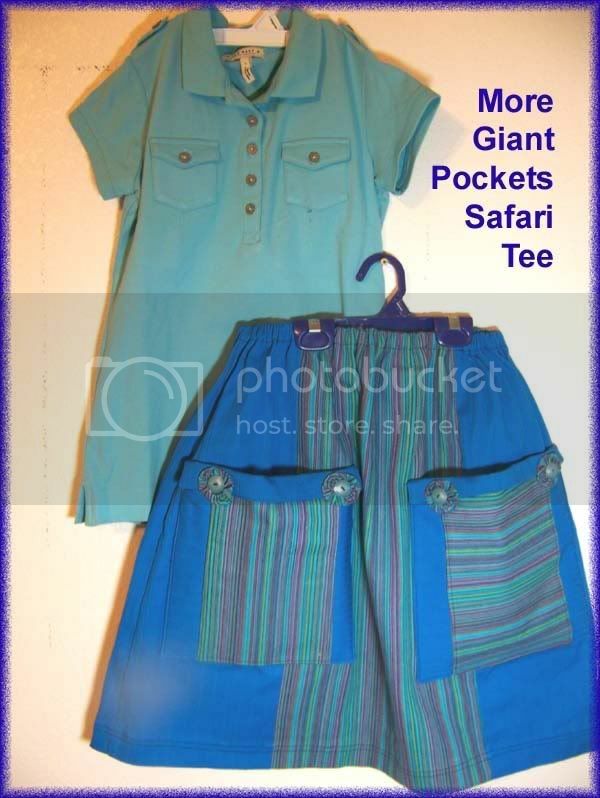 I have to shop for a couple of dozen tops for some skirts that came in without, but after that we should be ready to ship! 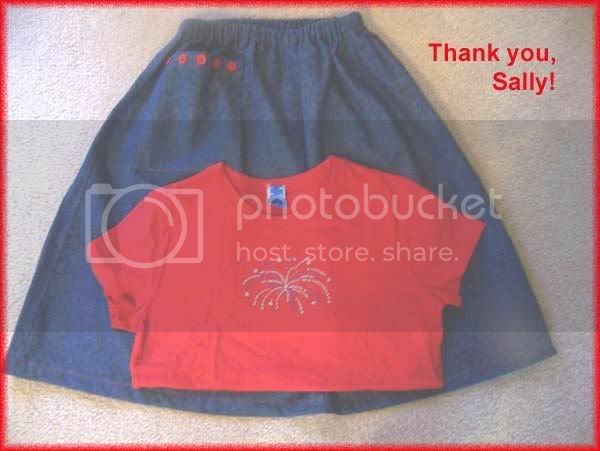 I was blessed to pieces to receive these ELEVEN skirts from Sally. 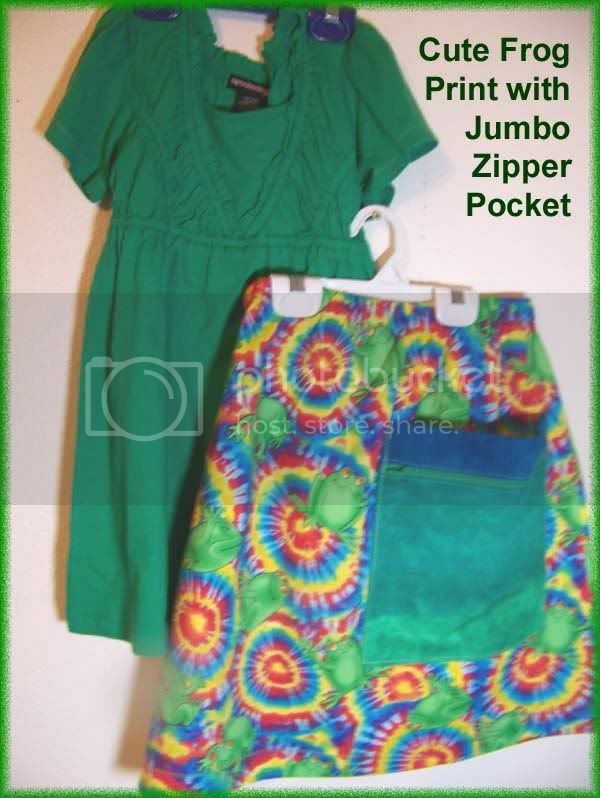 Sally sells children's clothing on Ebay. 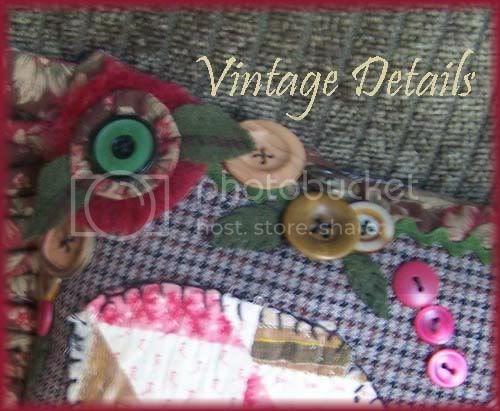 You can see her work and visit her seller page HERE. 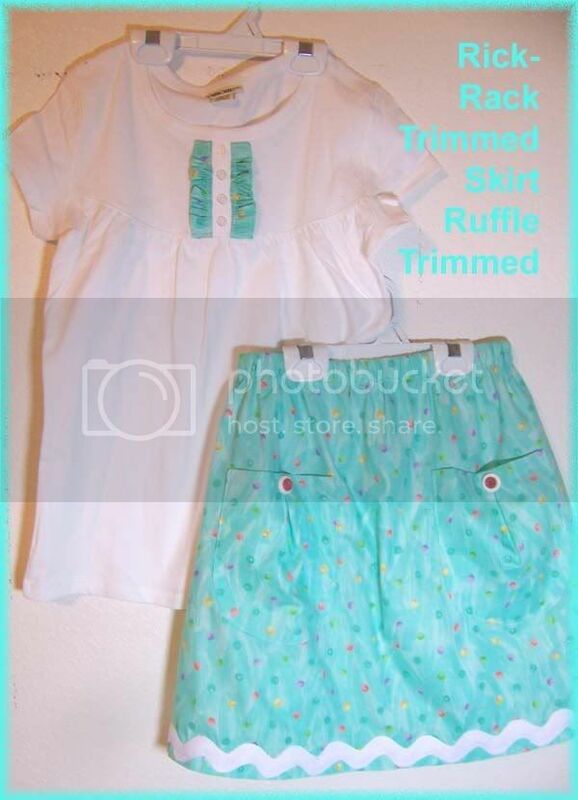 They are all beautifully made with sturdy mock flatfell seams, perfect topstitching and fun pockets or ruffles. 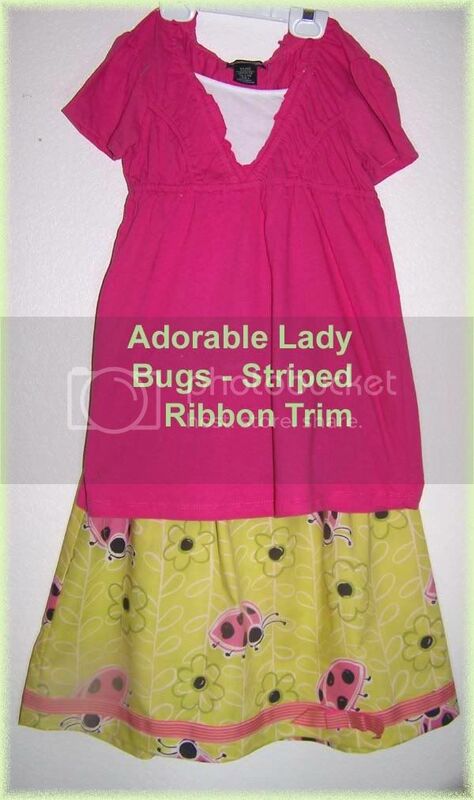 The fabrics are cheerful and soft, which will appeal to the young girls. So...here they all are...Please excuse the poor pictures. 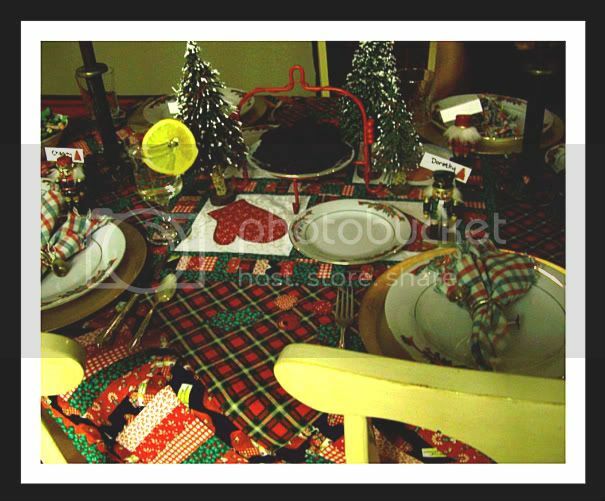 I had to shoot indoors as it is 20 degrees below zero outside. The lighting is poor. I'm sorry the photos don't do Sally's beautiful and generous gifts justice. 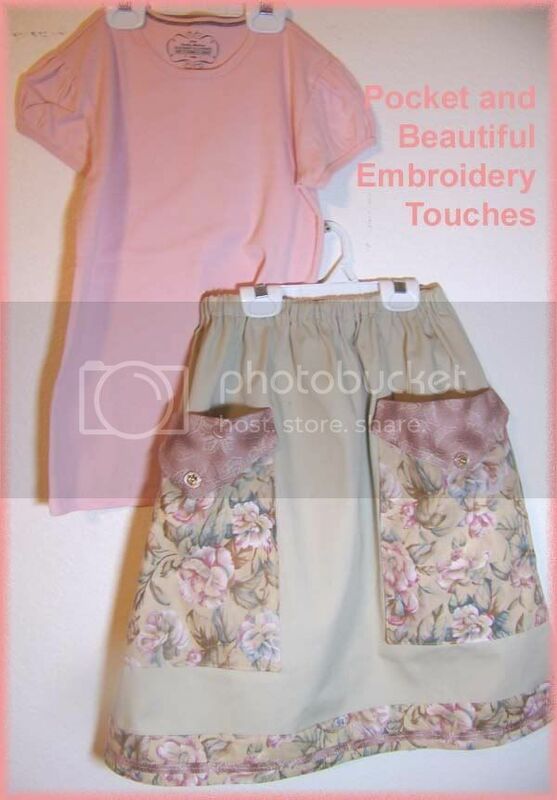 And these two skirts were sent in from Elaine. You can visit her blog by clicking HERE. You can also visit Elaine on her business website. They are lovely cotton knits. 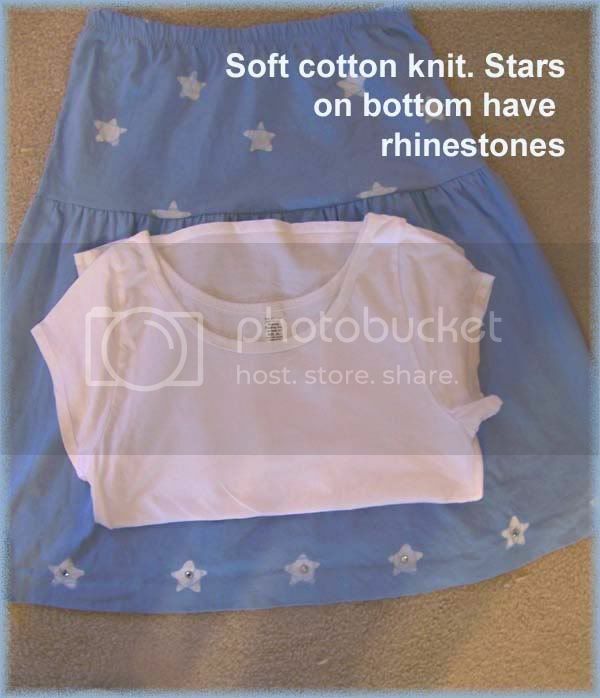 One has tie-dyed stars. She has embellished the bottom row with rhinestones. 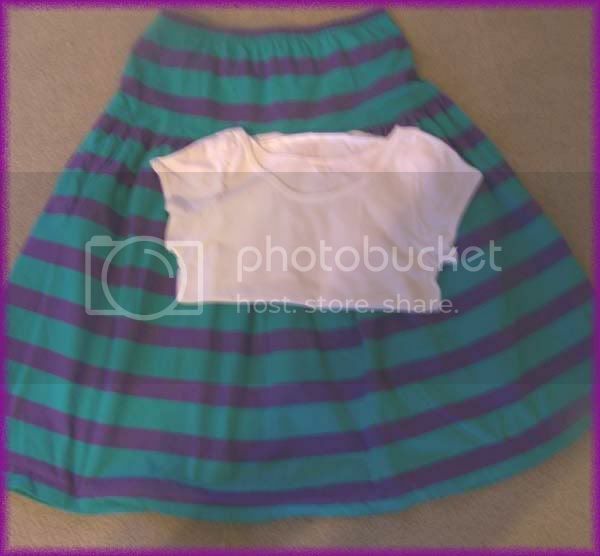 The other is a fun green and purple rugby stripe with generous pockets in the sideseams. These were sent in much needed large sizes. I didn't want the Plus-sized girls at the orphanage to get left out. Elaine also included a cash gift to help with international shipping. Very thoughtful! Thank you so much, Elaine! I only have a few more to post - as soon as they are completed and then we will be shipping soon. 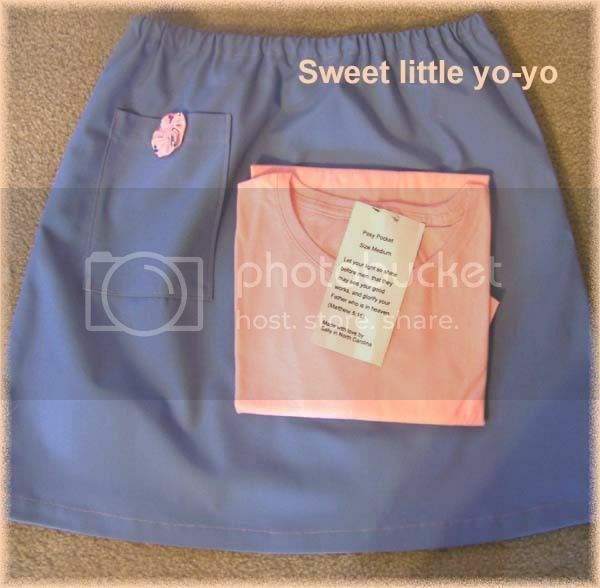 I will post one last photo of all the skirts in their baggies ready to go! And one of me at the post office mailing them away!! Thanks to everyone who has been part of this project. We're almost there! 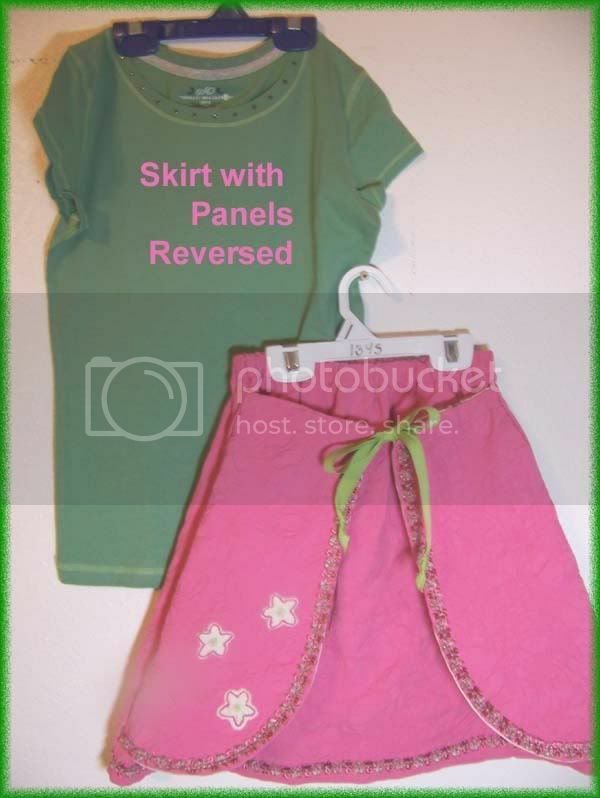 Six beautiful skirt sets arrived in the mail today. From Tammy Kniegge in nearby Anchorage. I will take pics and post tomorrow as it is already dark here in Alaska. Tammy did a beautiful job on the skirts. 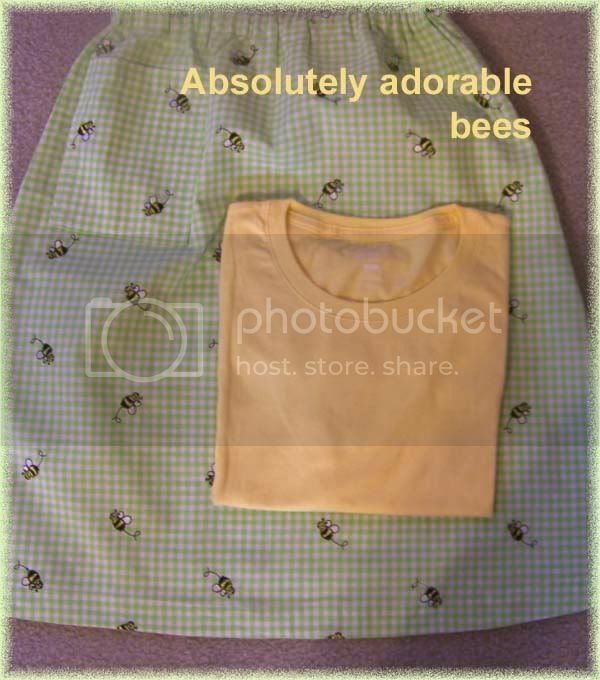 Each has a t-shirt and a special touch either on skirt or shirt. 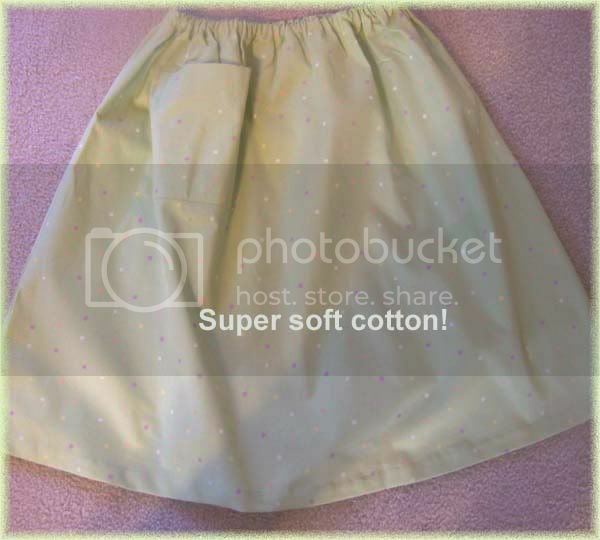 These skirts were received with much joy as the deadline is looming and I was getting nervous about making it on time! 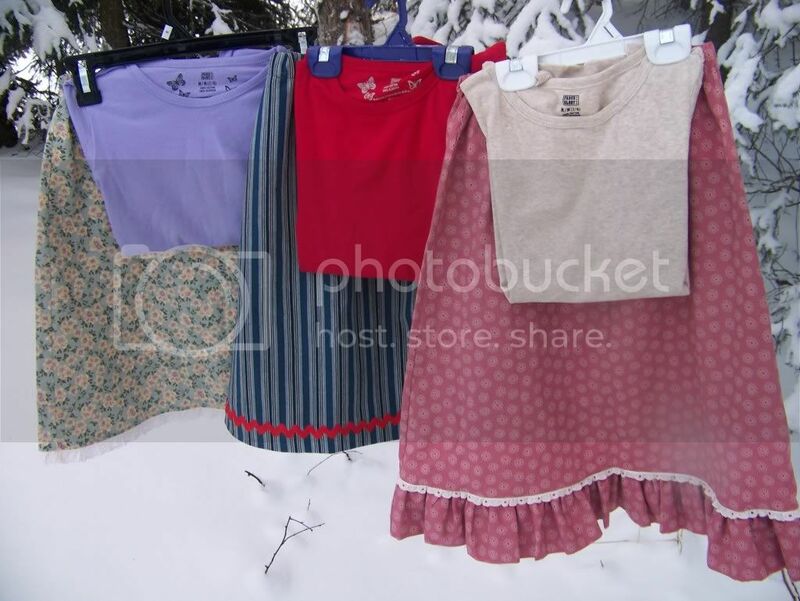 These new arrivals put us at 82 skirts received and ready to ship! Thank you SOOO much, Tammy. I will post pics tomm. as soon as possible. 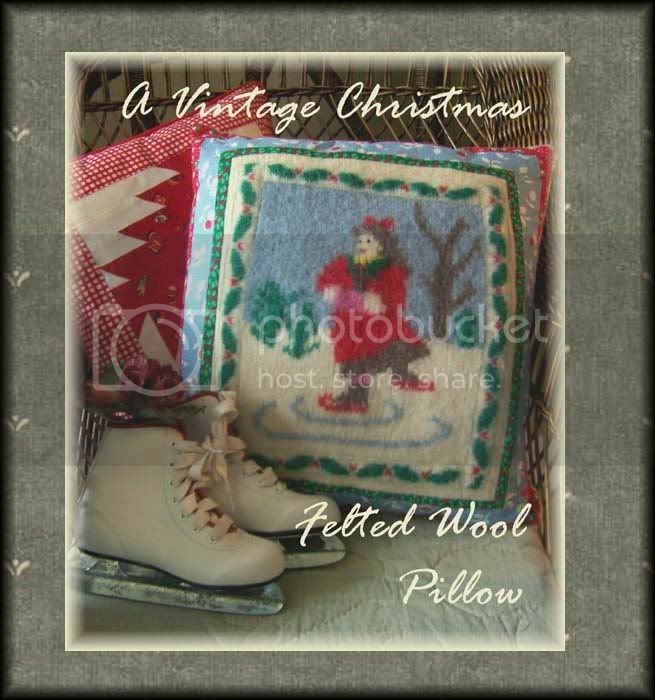 I'm currently working on an heirloom photo pillow. It is decidedly Victorian in flavor in soft shades of gold and ivory. A lace-framed tulle pocket provides a spot to tuck in a favorite photo, wedding invitation or vintage postcard. It's completed except for the stuffing and embellishment, some hand-beading, a few pearls, silk flowers, tassels, etc. 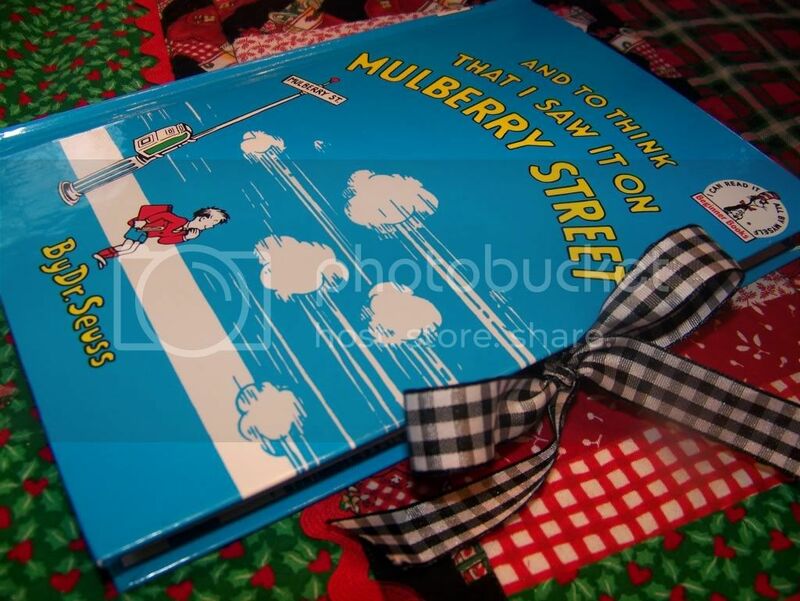 It's a Christmas present for someone who will remain unnamed lest she read my blog before December 25th. I'll post a pic as soon as I get the handwork done and a decent photo taken. 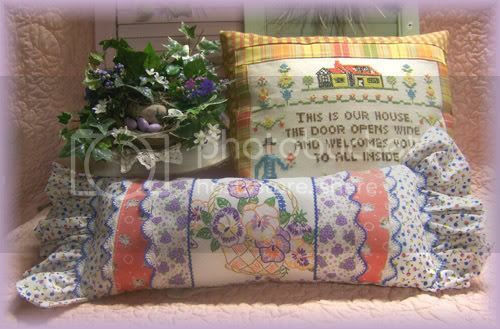 In the meantime, here are some pretty pillows found online. Here's another Christmas gift idea. I made a little notecard set from a vintage Dr. Seuss book. I simply used spray craft glue to adhere the illustrations to the front of a blank notecard. I bought a a set of 8 notecards at a local thrift store, new in shrink wrap for next to nothing. I lined the envelopes as well. But the fun part is the little folder. 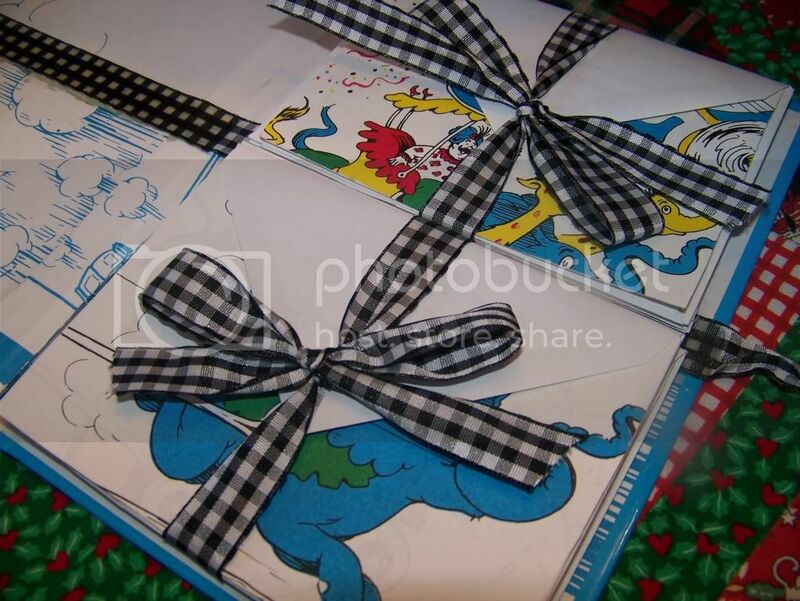 To make it, I simply ripped the entire inside pages out of a hardcover vintage Dr. Seuss book. I then covered the bare spot where the pages had been with a strip of paper cut from the end papers so it would match the inside of the cover. Then I glued a strip of ribbon across the middle of the book leaving long ends loose at the edges in order to tie the folder closed. I packaged the cards in sets of four and tied them with matching ribbon. 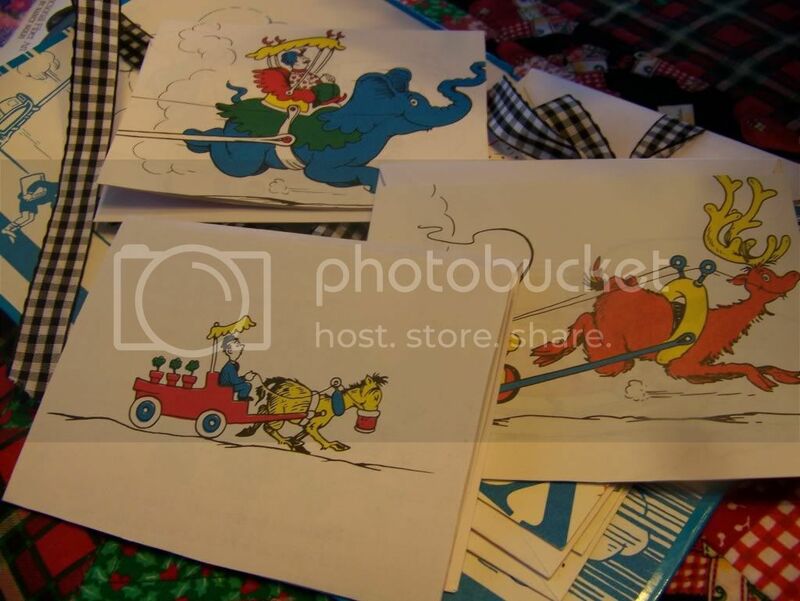 A fun presentation for a vintage children's book lover! 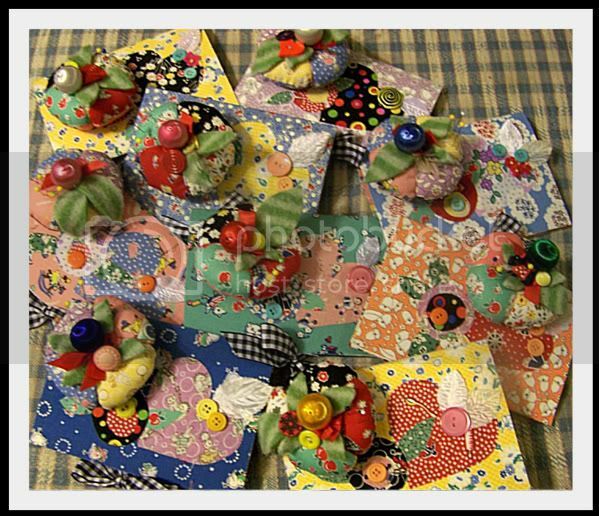 I just finished this little stash of gifts for some fellow seamstresses. 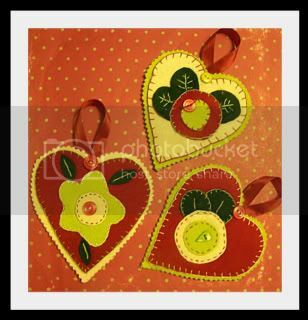 The tutorial for the needlebooks can be found in the tutorial list in the sidebar. 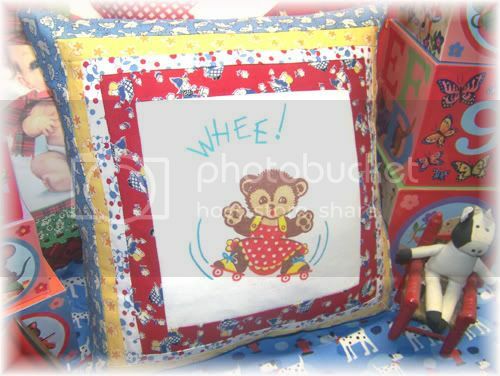 The tutorial for the pincushions are readily available online. Here is the link I used. I did a 4 patchwork circle rather than 6 simple because of time constraints. Great fun and fairly quick to complete.